Real estate information and statistics on U.S. cities, housing, crime, public and private schools and much more. Topics of interest are written for home buyers and sellers, real estate professionals and investors. There are basically two main types of residential mortgages and a number of other mortgage products designed for specific needs. 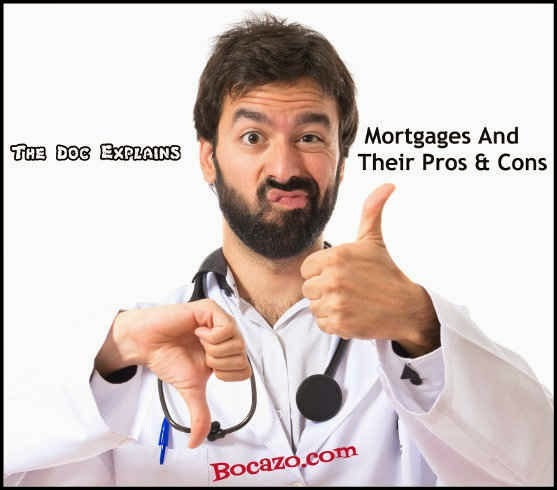 Below is a list of the more common types of mortgages, along with some of their Pros and cons. - The interest rate and monthly payments remains unchanged over the term of the mortgage. - Easier to understand and budget for. - Borrower cannot take advantage of falling interest rates. - Lenders are not usually flexible with the terms and conditions. - Rates are somewhat higher than other types of mortgages. - The rate is usually lower than that of a fixed-rate mortgage. - Compared to an FRM, the chances of getting a larger mortgage are better. - Falling interest rates work to the advantage of the borrower, reducing monthly payments. - Lenders will show more flexibility in meeting a borrowers requirements. - After an initial period, any rise in interest rates will increase monthly payments. - More difficult to understand. - Less knowledgeable borrowers may be vulnerable to shady mortgage practices. - Generally, it carries a lower interest rate than conventional loans. - Relatively easy to qualify for. - The loan is guaranteed by the Federal Government. - Requires a good and stable employment track record. - A down payment of less than 20% may require the payment of mortgage insurance. - A property has to meet minimum standards of habitation. - Guaranteed loans for active duty personnel, eligible veterans and their surviving spouses. - Low or zero down payments. - Easy to qualify for. - Easier to refinance a VA Loan than a conventional loan. - Limits on the size of loan. - A down payment of less than 20% requires the payment of mortgage insurance. - To guarantee the loan, a Funding Fee is charged. Typically it is 2% for new loans or 0.5% on refinance loan). - This is a fixed rate home loan for a period of five to seven years. Monthly payments are not subject to interest rate fluctuations. - Most balloon mortgages provide an option to convert to a new loan after the initial term. - Higher risk of foreclosure, as the entire balance of the loan has to be paid back when due. - Low monthly interest only payments, on a fixed term mortgage. - Risky for a borrower as the full balance of the loan is due at the end of the term.